Should we be rehabilitating Sargent, or his critics? 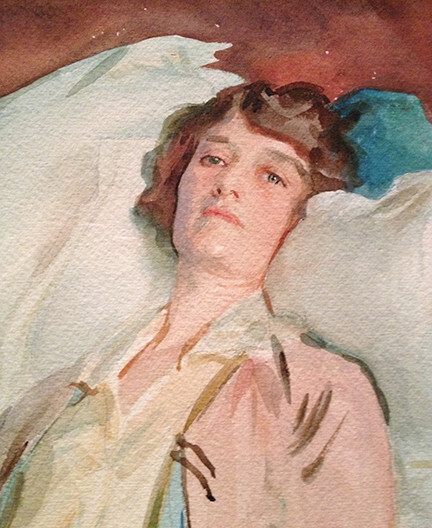 It is refreshing to read Peter Malone’s long and well-considered review of the just-closed exhibition of John Singer Sargent’s more informal portraits at the Metropolitan Museum of Art, Sargent: Portraits of Artists and Friends. “Compared to other painters of the day, Sargent’s work may at first appear reactionary, stuck in the late nineteenth century. However careful study of his composition and mark-making shows that he departed significantly from other nineteenth century painters, and his mature style is best considered as post-impressionist, akin to those of Joachín Sorolla y Bastida (1863-1923) and Anders Zorn (1860-1920). Sargent had neither shame nor caution about his style or methods, and during his lifetime his work was both successful and popular. However in the twentieth century, the opinions of critics like Roger Fry became more important than the artists themselves, and we still suffer from that legacy. Fry’s hugely influential account in Cézanne, a Study of his Development (1927), is an extraordinary book. For example, he starts his consideration of Cézanne’s The Banquet (c 1870) with the statement: “It is no use to deny that Cézanne has made a very poor job of it.” (Op. cit. p 11.) Nevertheless over the ensuing two and a half pages, he somehow manages to turn that “very poor job” into a major “visionary conception” indicative of Cézanne’s genius. There is also the extraordinary contradiction that Fry’s own paintings were probably more realist and reactionary than those of Sargent. Perhaps it is not Sargent who is in need of rehabilitation – his work still stands as evidence for his skill and accomplishment – but critics like Roger Fry, maybe even Clement Greenberg and Harold Rosenberg? And how, during the twentieth century, we became unable to appreciate art for ourselves, but had to let a small group of critics tell us what good art is? Posted in General, Painting and tagged bigotry, critics, fashion, mark-making, painting, Sargent. Bookmark the permalink. 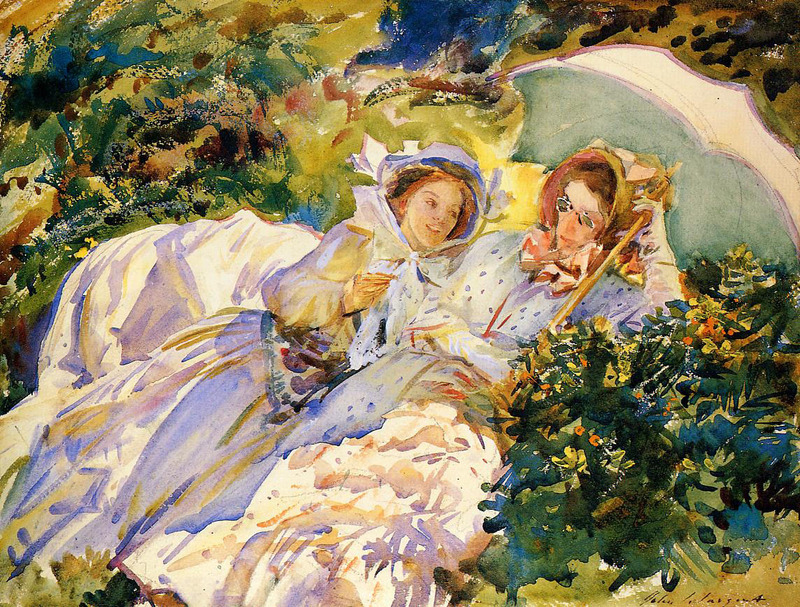 I never really understand why no one seemed to notice that Sargent’s watercolors were some of the best of his generation. 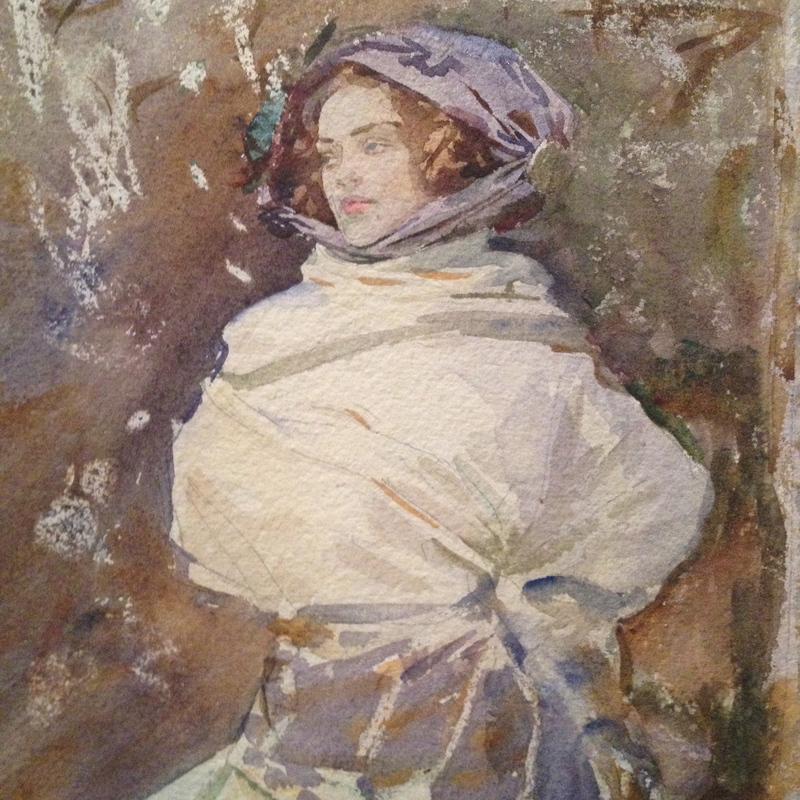 Certainly his techniques were non-standard (especially compared with the British watercolor tradition), and impressionistic. I think to really appreciate Sargent’s best works, it’s important to see them not only at the usual viewing distance in a gallery, but close up, because that’s where the extraordinary organization of paint strokes becomes apparent. In the oils, he was definitely expecting the works to be seen from 10 or more feet away. And the gestural strokes coalesce at that distance into a much tighter arrangement – it’s all a trick of the eye. The interesting thing is that his watercolors, which are much smaller works, sometimes have just as much busy slashes of pigment as one would expect in an oil painting. 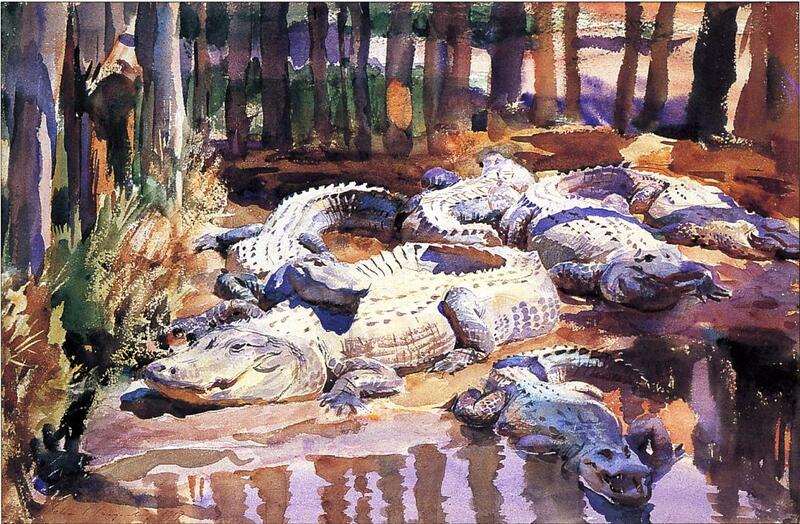 But Sargent experiments even more with color and light effects. The dress featured in the complete painting has a crazy amount of dabs of varying medium blues, turquoise, violet-grays, browns, as well as opaque white strokes. The image above is the best, full-sized copy I’ve ever seen – it’s possible to look very closely at the strokes and pencil marks.